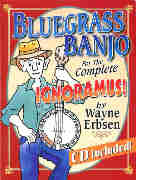 The simplest bluegrass banjo book ever written. It can teach anyone to play, we promise! Includes instruction CD with 99 tracks. We guarantee this book will get you started playing bluegrass banjo.